Providing you the best range of servo master with effective & timely delivery. We are acknowledging as leading manufacturer, supplier and exporter of widely demanded Servo Master. 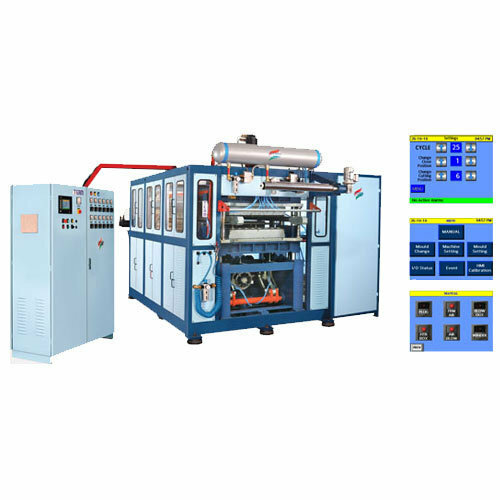 Our offered thermoforming machine operates on the power of hydraulics and speed of pneumatics which is implemented by using electric toggle mechanism. Our prestigious clients can utilize TMF Servo Master for all kinds of forming applications at lowered operational costs. Mould closing unit is based on a 5 point toggle lever mechanism with closed lubrication system. A servo motor with gear operates the toggle lever to offer platen speeds of more than 500mm /sec. This translates into fast and highly dynamic process movements and short dry cycle times.